She's teaching her party how to take the events of a moment and weave them into a narrative that addresses the fundamental challenges facing the country. Many thoughtful media reports on the remarkable address that Massachusetts Senator Elizabeth Warren gave at the Minnesota Democratic-Farmer-Labor Party’s Humphrey-Mondale Dinner have focused on the fact that she took apart Paul Ryan. There is no question that the senator from Massachusetts shamed the congressman from Wisconsin. However, what Warren really did in her March 29 speech in Minneapolis was school Democrats with regard to what they should expect from a presidential contender. 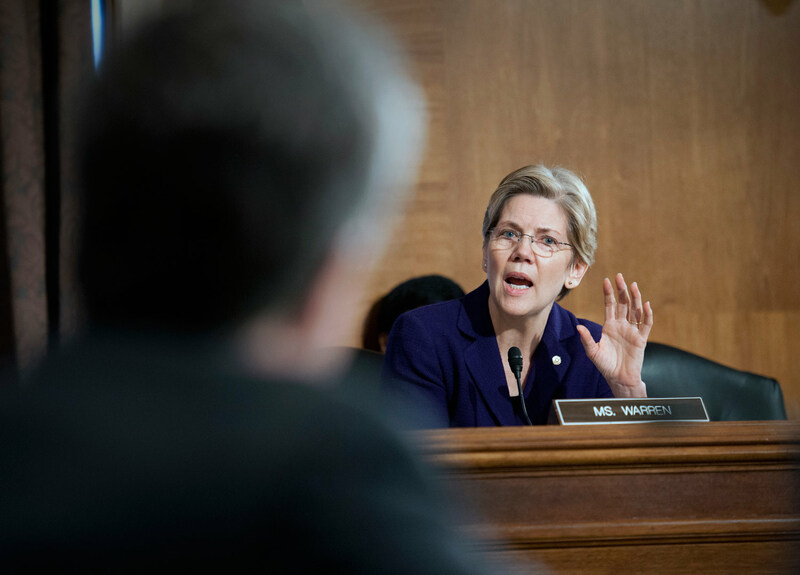 Yes, yes, Warren has said that she is not running for the Democratic nomination in 2016. And there are plenty of polls to suggest that, were she to enter the race, she would not have an easy time competing with a prospective Hillary Clinton candidacy—although, notably, Warren’s numbers rise rapidly in hypotheticals that do not feature Clinton. But let’s put the polls aside for now. Let’s recognize that a necessary politics does not just reflect public opinion, it anticipates concerns and answers them in bolder and better ways than pollsters and pundits can calculate. Those who would lead the nation ought to offer much more than a set of approved talking points. There must be a vision, a language, that explains the crisis, and inspires a response. This is a truth that Vermont Senator Bernie Sanders has brought into his discussions of a possible presidential run, especially when he suggests that any bid by a progressive in 2016 would have to be “revolutionary” in its rejection of the narrow thinking and narrow strategies that have produced low-turnout elections and low-results governance. Sanders gets that the politics of 2014 and 2016 must go deeper—as does Warren. This has a lot to do with issues. But it also has to do with approach. Democrats can’t just talk about inequality. They have to address the economic and political underpinnings of insecurity and injustice. They have to challenge the assumptions of those who argue for the failed strategies of the past. Paul Ryan looks around, sees three unemployed workers for every job opening in American, and blames people who can’t find a job. In 2008 this economy crashed, wiping out millions of jobs. Paul Ryan says don’t blame Wall Street: the guys who made billions of dollars cheating American families. Don’t blame decades of deregulation that took the cops off the beat while the big banks looted the American economy. Don’t blame the Republican Secretary of the Treasury, and the Republican president who set in motion a no-strings-attached bailout for the biggest banks—nope. Paul Ryan says keep the monies flowing to the powerful corporations, keep their huge tax breaks, keep the special deals for the too-big-to-fail banks and put the blame on hardworking, play-to-the-rules Americans who lost their jobs. Let me tell you: That may be Paul Ryan’s vision of how America works, but that is not our vision of this great country. The DFL crowd gave her a knowing ovation—not just for a point well made but for a concept fully formed, an argument taken to its logical and effective conclusion. Whether or not Elizabeth Warren ever runs for the presidency, she is teaching her party a great deal about how to take the events of a moment and weave them into a narrative that addresses the fundamental challenges facing the country. This is powerful, and powerfully important—especially at a point when the Democrats are wrestling with how to connect with the great mass of Americans who feel insecure economically, who worry about income inequality, but who are not quite sure that either party is on their side. When Democrats have been at their best politically, there has never been a question of where the party stood. Political parties are at their strongest when their tribunes argue for what they believe. Elizabeth Warren knows this, instinctually.